Would you like your iPhone to give you audible driving directions? If so, you should check out MapQuest. 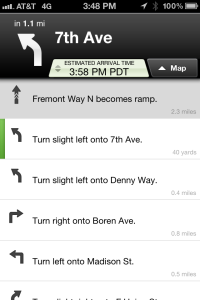 It is a free, turn-by-turn GPS navigation app for the iPhone and iPad. MacWorld wrote an extensive review of GPS apps in 2011. After reading the article, I purchased Navigon for $40. (It price has now risen to $60.) I used Navigon for a few months and liked it,but found the interface cumbersome. After a client praised it for its easy-to-use design, I tried MapQuest. It had also been highly rated in MacWorld’s review of GPS apps. While MapQuest doesn’t have all of the features offered by Navigon, I prefer it for its relative ease of use. Here’s a quick overview of how I use MapQuest and why I like it. I open MapQuest, tap the Menu button and tap on Directions. I’m then presented with a screen listing “Current Location” as the starting location. To fill in the destination I could either type in an address or tap a button to pull up my Contacts list. Since I faithfully add all client addresses to my Contacts list, I usually use this option. I then tap the Get Directions button. After waiting a few seconds an overview map as well as the distance and estimated travel time are listed. Next I typically tap the Start Voice Navigation button. However, sometimes, I like to quickly preview the route, so I’ll tap the List button. An overview map is depicted to the right. Below is a sample of a route’s list view. 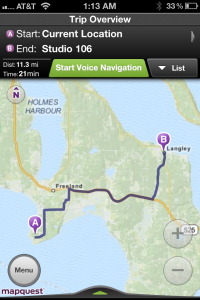 While listening to the driving directions, the map updates automatically and displays your location on the map. The map automatically rotates so the map is oriented to the direction in which you’re driving. Additionally, there is a status indicator which lists the estimated arrival time, the distance remaining and the time remaining. The beauty of MapQuest is that so many options are just one or two taps away. In the middle of a trip, one can tap the Menu button. This gives you options to adjust or mute the volume, show current traffic conditions, pause or stop the navigation, edit the current route or select a new route. If you edit the route you can add a new stop along the way. The Menu options appear in the picture below. Another button lets you instruct MapQuest to display banks, hotels, gas stations, grocery stores or other types of businesses. There are some short-comings of this app. I’ve listed them below. Some of the font sizes are really small. I know it’s tough to fit information onto such a small screen while maintaining font sizes, so this is just a necessary trade-off I suppose. When MapQuest indicates that I’ve arrived at my destination, it really means that the destination is ahead about 50-75 meters. Sometimes when I’m in the middle of a route and I’m driving an extended distance on one road, I’d like to be able to easily get an on-demand audio update. For example, “Continue 5 miles to Exit 169 for NE 45 St.” The screen always displays this information in text, but the appeal of a GPS app which gives audible instructions is that you don’t want to have to look at the screen while driving. Regardless of these short-comings, MapQuest is a solid application. The price can’t be beat and it’ll work with iPhone 3GS and newer models. Apple’s own Apps application was upgraded in iOS 6 in 2012. It now includes turn-by-turn voice navigation feature. I will be giving this app a try to compare it. Update March 2013: Apple’s iOS 6 is out and widely available now. Despite some early glitches, it’s proving to be a solid first attempt at mapping software for Apple. Also available now is the free Google Maps app. It also provides audible driving directions. 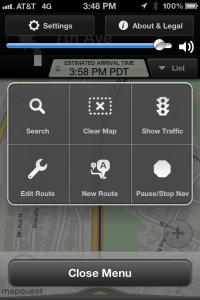 Read more about Apple, driving directions, easy to use, GPS, iPad, iPhone, maps, turn by turn.